The days are long and the sun is bright; it’s the perfect time for your Sims to enjoy The Sims 4 Backyard Stuff*, now available! 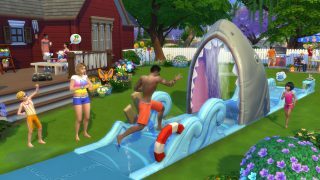 One thing’s for certain, there’s plenty of new fun outside for your entire Sims’ family to delight in with The Sims 4 Backyard Stuff. Looking to learn more about recent updates to The Sims 4? Check out the Jealousy Reaction System updates, and learn about the updates to Gender Customization.